If you're looking for SpaceX - Space Exploration Technologies of Hawthorne, CA, then please visit www.spacex.com. The Spacex Art Gallery in Exeter, UK is found at www.spacex.co.uk. This site was started -long- before there was such a thing as a smartphone or a tablet, so no specific provisions for display on such devices are included. But since the basic layout is even older (from the days of smallish CRT monitors), the page width should fit a regular-sized tablet display in landscape view. However, this site was built in HTML5, which means you -will- need a decent and recent browser. Any Internet Exploder up to/incl IE8 will not display properly, so do yourself a favour and get Firefox, Safari or Chrome instead. This site is non-commercial. 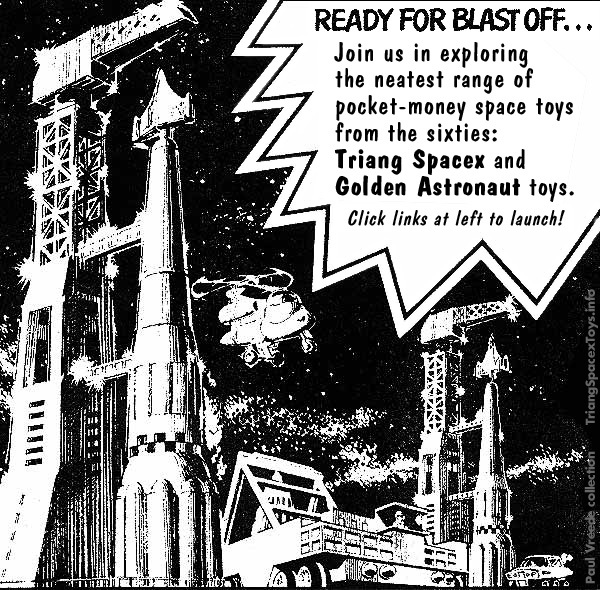 It is solely intended for research on and information about certain vintage space toys which are long out of production. Any material shown or quoted that has not been originally created/written for this site are excerpts © their respective owners, and used here for research and informational/educational purposes only. This constitutes "fair use" or similar under the legislation of the countries these materials originate from. Nonetheless, any questions or issues I will of course help to resolve. As of 2018, I'm delighted (and relieved :) to see this site is being archived and accessible through the invaluable Wayback Machine. However, none of the links appear to work from the home page there, due to some apparent incompatibility in syntax. At time of writing, starting from this link should work. Should that also go haywire in the future, then try following the "Summary of triangspacextoys.info" link on their 'calendar page', where there's an "Explore triangspacextoys.info URLs" link which then gets a page list where you then try starting from any page -other- than the indexes.